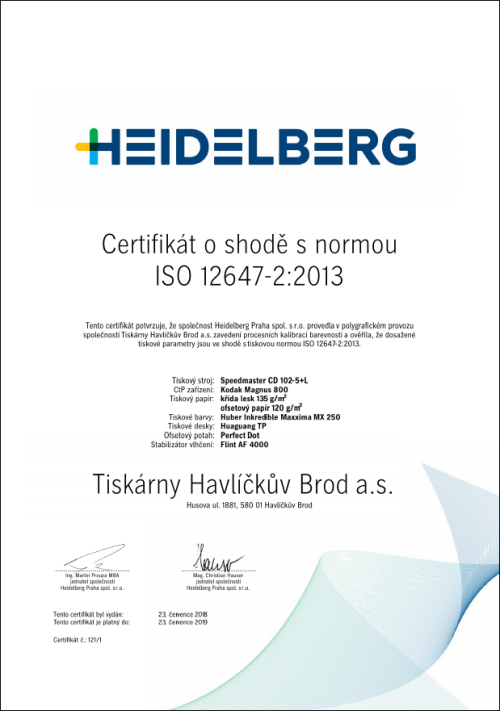 Printing machines in Tiskárny Havlíčkův Brod, a.s. are regularly certified according to ISO 12 647-2:2013. Printing machine XL 75-4 certified according to ISO 12 647-2:2013 on June 16th 2018. Printing machine XL 75-5 certified according to ISO 12 647-2:2013 on June 16th 2018. Printing machine CX 102-4 certified according to ISO 12 647-2:2013 on June 23rd 2018. Printing machine CD 102-5 LX certified according to ISO 12 647-2:2013 on June 23rd 2018. 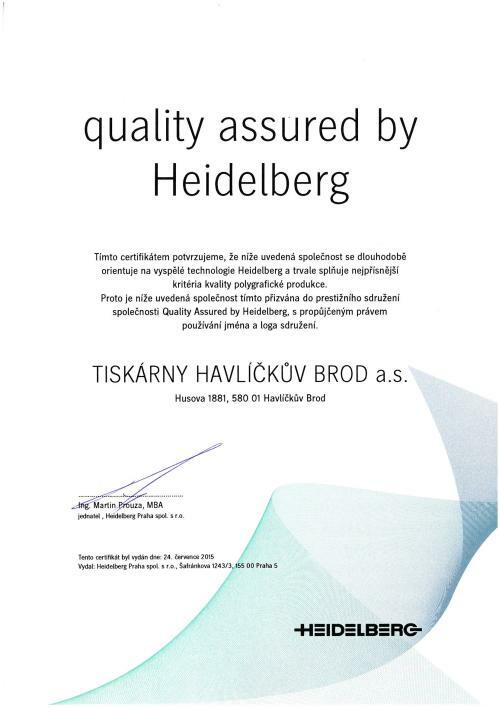 Tiskárny Havlíčkův Brod, a.s. has become a member of the Association of Quality assured by Heidelberg. Granting Certificate confirms our long-term focus on the use of advanced technologies. It confirms our ongoing efforts to achieve high quality printed products. 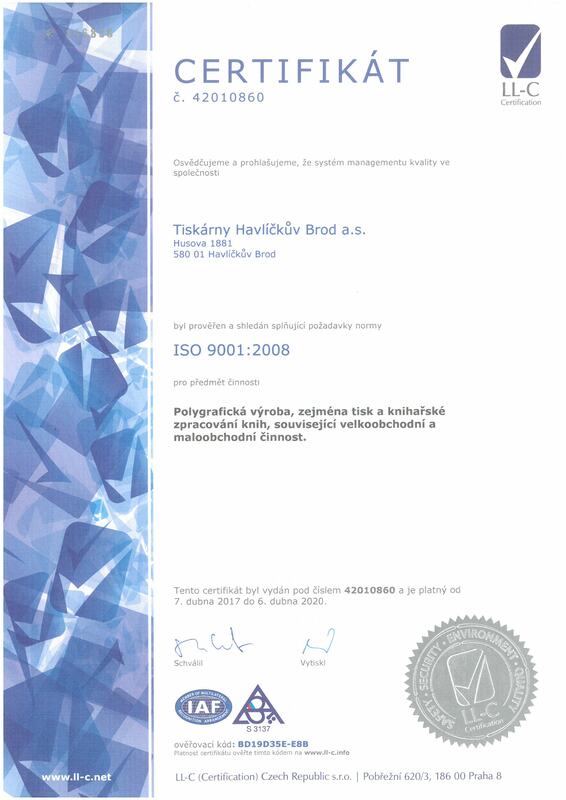 The production quality in Tiskárny Havlíčkův Brod, a.s. is ensured by the quality management system ISO 9001:2001. 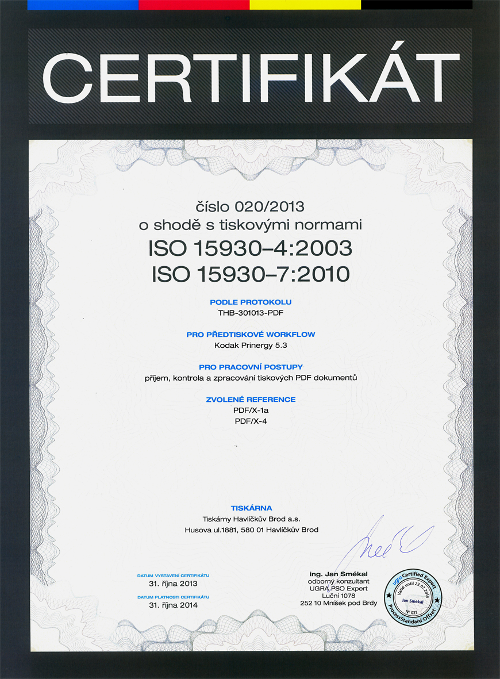 In 2001 the company acquired the certificate number C-61006. In 2017, the company received recertification aurit according to EN 9001:2008. Certified workflow for checking the received data according to the standard PDF / X-4.